In the calendar year 2008 Scone Concrete recorded sales of posts strainers and stays in the Casino and Lismore region at just 61 tonnes. This year, to 31 October 2009, sales exceed 248 tonnes, which is a 408% increase. 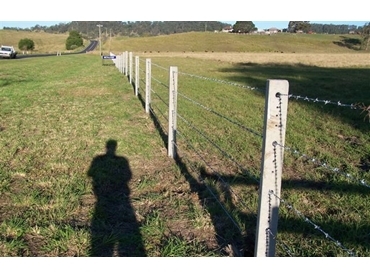 In other regions of NSW and southern Queensland pre-stressed concrete fence posts continue to make strong inroads into the fencing market, in fact Scone Concrete have set new sales records of pre-stressed concrete fence posts on the north coast of NSW. At the Pro-Ag Field Days in Macksville on the weekend of October 16-17, pre-stressed concrete fence posts attracted a lot of interest from farmers and residents of the mid north coast. Also during October, two new agencies were engaged in south-east Queensland. They are Beaudesert Gates & Steel and Boonah Mitre 10. As pre-stressed concrete fence posts are driveable, durable (termite and fire resistant) and affordable they are suited to this region.